Workshops are a great way to try your hand at something new like painting a portrait from life or sketching in the open air to cutting mounts in order to present your work. They can be three to six hours long and focus in on a specific medium (like pastels or watercolours), or particular subject (like drawing or painting animals, people or buildings). If you would like to dip your toe into something new, please fill in the form on the Contact Kate page and suggest your area of interest. The Summer Art Challenges aim to enjoy the Great British summer weather in beautiful settings where the challenge might be to paint a bed of flowers or draw a historic building in perspective whilst dodging the showers! The price includes entrance fees if applicable and times vary - days are planned at the Weald & Downland Museum for 2019. 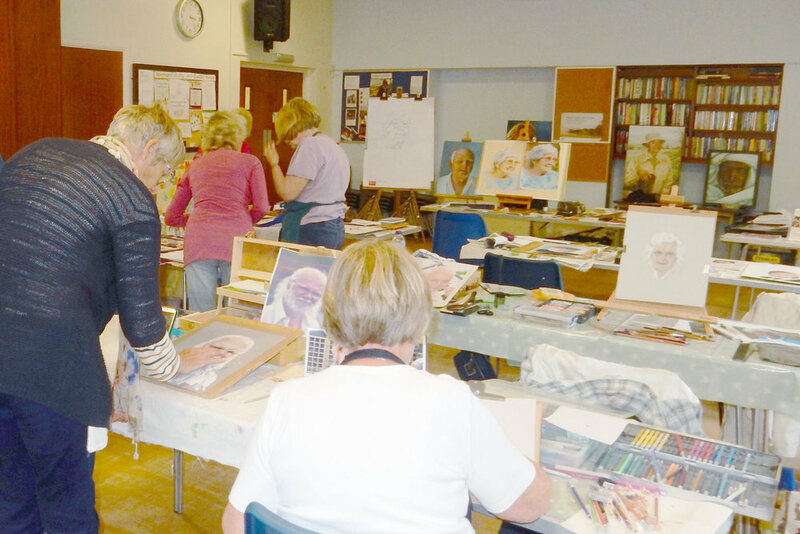 If you already go to an art group and would like some additional tuition, Kate can be booked for a day to come along and teach or demonstrate whatever subject your group would like. She is also gives talks on life as an artist and her process of taking on commissions. WATERCOLOUR DAY - Wed 4th Sept. The workshops run from 10-4pm, cost £65, includes morning coffee and afternoon tea and we have an indoor space if the weather turns! Book with them direct or contact Kate for more details: www.wealddown.co.uk. This is a lovely opportunity to sketch the naked human form and test your observational skills to the max. Kate books professional models for 3 or 6 hour sessions starting with drawing short poses using pencil or charcoal and then your preferred medium for longer poses. Please contact Kate if you are interested. Borde Hill Garden, near Haywards Heath, RH16 1XP and Parham House & Gardens, Pulborough, RH20 4HS, invited us to spend a day painting in their gardens last summer. If you would be interested in painting ‘en plein air’ again this year, please contact Kate. You will need to bring all your art materials, a portable chair to use in the gardens, sunscreen and a hat! Lynne Friel will teach the workshop and Kate will be there to assist (and provide cake of course!!). Mount cutters and practice card is provided, you just bring along some pictures that you would like mounted, and a packed lunch. Lynne gives loads of great step-by-step instruction on how best to crop and mount your work so that they are ready to slot into any standard sized frame. There will be conservation grade card (£5 per sheet) and mount-cutters available to buy if you 'get the bug' by the end of the day! It's a fun course and very satisfying when you see your work displayed professionally.